What causes log home rot? There are many factors that contribute to rot in log homes. Some are easily avoidable, other causes of rot are not so easy to defend against. 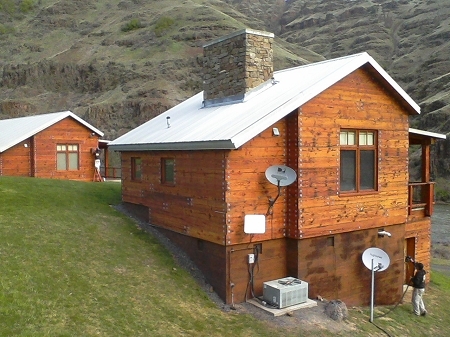 In this article, I will talk about the things you can do to minimize the chances of the logs in your log home developing rot. If you are one of the lucky ones to actually have a say in the building of your log home, there are many things you should be aware of that will minimize the chances of developing rot in your new log home. The first thing you can do is be very vigilant about choosing the right logs in the first place. 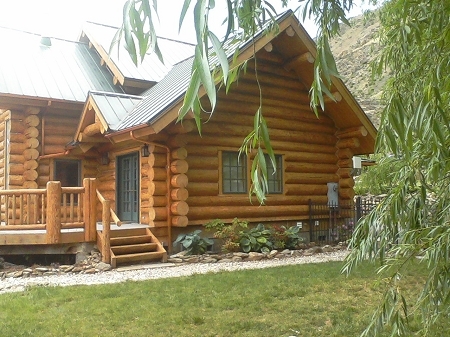 Many rot situations we have come across were inevitable from the day the log home was built due to choosing the wrong logs, this is usually the result of hiring a log shell builder who does not understand what a good house log is. There is a grading system in place for house logs, be sure that your builder uses graded logs that are certified for log home use. Some other things to consider during the planning phase is the height of the foundation, it should be high enough to protect the logs from backsplash from water running off the roof, a taller foundation can look great when faced with natural stone or river rock and the distance between the sill log and the ground minimizes problems with water damage and insect migration. The other design feature that can save your logs from premature rot is designing and building your roof to have extra large overhangs, 3'to 4' overhangs really protect your logs, especially in you are building more than one story. Also, pick your home site so water drains away from the foundation, if this is not possible be very vigilant with drainage systems at the base of your foundation. There are many good drainage products on the market. The most important part of keeping your logs safe from log rot is to keep a water repellent wood finish on your logs. Choosing a quality stain for your logs and keeping up on the maintenance is probably the best defense you have against rot developing. Stay away from form-filming products that tend to trap moisture, peel, and generally make maintenance difficult without extreme measures such as blasting, heavy sanding, and harsh chemical stripping. 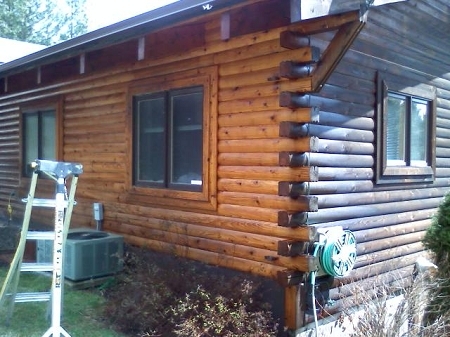 I recommend using a penetrating, premium quality log home stain that is designed to deep penetrate into the wood, filling the voids and grain within wood with oils and resins. This type of wood finish protects the wood from the inside out and maintenance is as easy as a quick cleaning with mild cleaners and re-coating the logs. 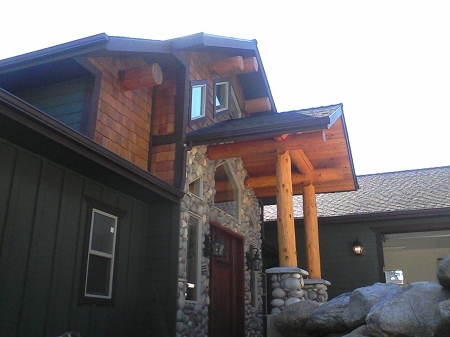 Our finishes at Lovitt's log home stains were designed exclusively for log homes and natural wood structures. Our professional quality stains deep penetrate the grain and lock into the wood providing excellent protection from water intrusion and UV degradation. But best of all, in 3-5 years down the road the finish will not peel, flake, or discolor like many products available today. The maintenance consists of a light cleaning and a fresh re-coat when the time comes. 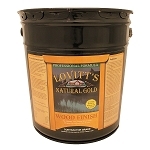 With Lovitt's premium coatings you have a long term partner in the care of your log home to reduce the chances of falling victim to log rot. Log rot is a serious concern, the repair and replacement of logs can be a very expensive alternative to not caring for your logs properly. If you find yourself in a situation where the rot has taken hold, you should seek out a qualified log home repair expert to perform the repairs. We recommend talking with MM Wood Restoration & Protection for guidance when you are in that situation, they can help you through it with quality advice, service and guaranteed repairs. They can be reached from their website at www.woodspecialist.com. 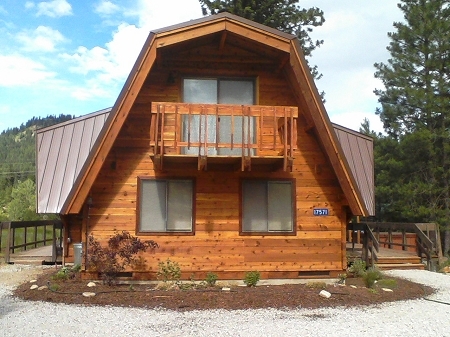 I believe the Lovitt's Emerald Gold log home stain uses propylene glycol in its' formulation. It does has amazing qualities against mold, fungi, and bacteria growth. Emerald Gold also has HD tinting to battle UV degration and uses nanotechnology advances in the formula. But, I also know that ethylene glycol should NOT be sprayed on wood, that is automoblile antifreeze formula which is completely different than propylene glycol that is in Emerald Gold, I would not recommend using ethylene glycol on wood surfaces.